Doubledecker is a fast train and can reach the speed up to 160 km/h. There is Wi-Fi zone all over the train. One of the cars is adapted for people with disabilities. 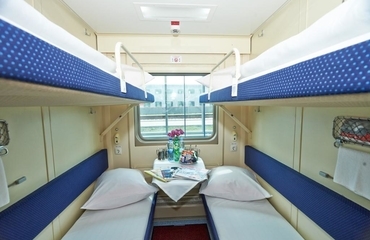 The first Russian two-story train was designed just before the Olympics in Sochi-2014. It started running along the Moscow - Adler line in November 2013. 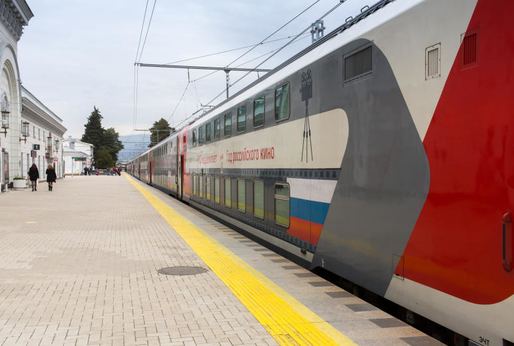 The second Russian double-decker train appeared on the route Mosow – Saint-Petersburg in 2015. Now there are 9 overnight double-decker trains operating on 7 popular routes. Most of the doubledeckers have only 2nd class compartments located on two decks. This solution allows to replace old-fashioned 3rd class (Platzcart) compartments with much more comfortable, modern and affordable option. All coaches have modern design and are equipped with an air conditioning system, LED lighting, heating and clean comfortable toilets. The access to the compartment is carried out by magnetic key cards, which allows passengers to be sure that their belongings are safe while they temporarily leave their compartment.